In purely engineering terms sailboat masts are structural columns designed to resist the compressive loads and bending moments applied by the rigging. Leonhard Paul Euler (1707 to 1783), a Swiss mathematician and physicist who probably didn't know one end of a sailboat from the other, provided us with the theory that structural engineers and mast designers rely on to this day. Euler established that a column will buckle long before the applied load would cause it to fail in pure compression, and went on to prove that the load at which buckling failure will occur depends on the 'slenderness ratio'. This is expressed as the effective length of the column divided by the radius of gyration of the column section - the l/r ratio. In their quest for minimal windage and ultimate mainsail shape control, designers of racing yachts push the slenderness ratio to the limit, relying on elaborate lateral support provided by multiple pairs of spreaders and complicated sets of shrouds. These finely tuned, unforgiving structures require a high degree of operator expertise and maintenance. Stunning as they are, they have no place on an offshore cruising yacht. For us cruising sailors, mast failure is a catastrophe that should be avoided at all costs. 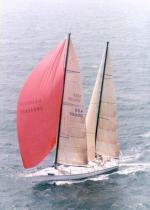 Most often, as on the beauty shown here, mast, boom and spinnaker poles will all be manufactured from carbon fcomposites. 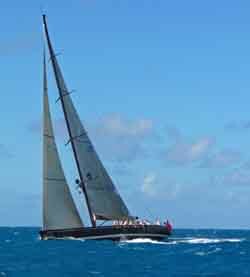 There is still a thriving business in making wooden masts and spars for the classic yachts of yesteryear and their modern replicas, but sailboat masts for today's cruising yachts are far more likely to be engineered from aluminium extrusions. Certainly that's the case for sailboats with stayed rigs, but for unstayed rigs, the lightness and stiffness of a tapered keel-stepped carbon composite mast makes it the only practical option. A typical aluminium mast section with an integral mainsail track is shown here. If this mast was designed for in-mast roller furling, then the section would be modified to incorporate a structure to house the furling gear and an enlarged mast slot for the mainsail. This is where most of us fit some highly important equipment; the windspeed and direction sensor, the VHF antenna, the tri-colour light and the Windex. The Windex is a most useful, low cost item that consists of two sights and a pivoted pointer that shows us the apparent wind direction. Unlike electronic instruments, it never lies. It's not a great idea to put the radar reflector or the radar scanner itself anywhere near the top of the mast, as the heeling moment produced will work against the boat's righting moment, affecting stability. But it is a good idea to inspect the masthead from time to time, either by going aloft or removing the mast. 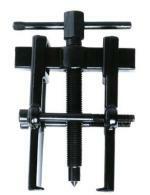 Check out the shroud terminals for wear, particularly for any ovalisation of the eyes or bent shackle pins. Look for stress cracking in the corners of sheave blocks and check that the sheaves revolve freely. And take a close look at any electrical cables where they exit the mast; if the cable insulation has chafed through, any stray current will help electrolytic corrosion along nicely. It's always worth using rubber grommets at cable exits. Lower down, check the gooseneck (the fitting that connects the mast to the boom) for solid fixature to the mast, and similarly the lower fitting for the boom kicker. Unless your halyards are taken back to the cockpit you'll have a cluster of other fittings at the foot of the mast; winches, jammers and cleats. If the base plates for your winches are made of bronze as most are, then you'll need a layer of insulation material between them and the mast to prevent galvanic corrosion. 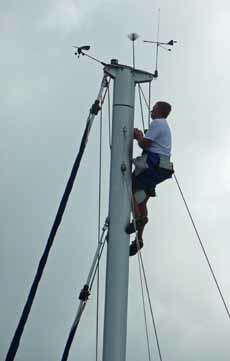 Most mast-builders choose rivets for attaching fittings to the mast. It's a quick and easy method, but not as strong as an engineering screw of equal diameter, and if you want to remove a fitting you'll have to shear the rivet off. In which case you just might decide to drill the old rivet out, tap the hole and use a stainless engineering screw. Remember to smear the threads with something to prevent galvanic corrosion; white lead, paint or silicone should do the trick. A Keel-Stepped or Deck-Stepped Mast? If a shroud parts the mast is likely to remain standing, supported by the cantilever provided by the keel step and the partners. In the event of a capsize any damage to the mast is most likely to occur some distance above the deck, leaving a mast stub available for a jury rig. But unless the deck is massively strong at the partners this area is likely to suffer structural damage, which in conditions severe enough to cause a capsize will be very serious indeed. A lesser problem is that rainwater always gets inside the mast through the various openings and a keel stepped mast ensures that this ends up in the bilge rather than draining out on deck. Nevertheless, for sailboats of 40' (12m) and above, a keel stepped mast is the more seaworthy option. A mast stepped on deck must be supported by a compression post below, which will transfer all mast loads to the keel and floors. Structurally, a deck-stepped mast is pin-jointed in the deck mounted baseplate. This helps for a dry bilge and facilitates easier removal at layup time, but does make it more likely that if you lose your mast, you're going to lose all of it.